I'm not sure if this is the right place for this post. 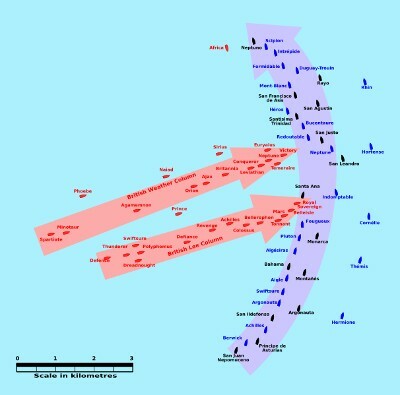 I understand (rightly or wrongly) that in Naval warfare crossing the T meant a ship or ships crossing in front of an oncoming enemy and exposing them to a full broadside when the enemy can only reply with their forward guns, I also believe that this was done by Jellicoe when his main battle fleet confronted the High Seas Fleet. My question is this, while it is appreciated that it would take some time for the High Seas Fleet to tun in order to open all their broadsides, had Admiral Holland achieved his objective which I believe was to cross Bismarck's T (which might have made for some interesting moments for PE who was in the lead) how long would it take for a big ship like Bismarck (and of course PE) to turn to either Port or Starboard in order to bring all their guns to bare on Hood and PoW and if it was only a matter of a few minutes would it have made any difference anyway? Shouldn't have been relevant in the Battle of the Denmark Strait. Bismarck openened fire several minutes after Hood, after multiple requests from the chief gunnery officer to be given permission to fire, and they had been aware of the British force long before that. They had all the time in the world to adjust tactical paramters to their liking. Paul Mercer wrote: "...how long would it take for a big ship like Bismarck (and of course PE) to turn to either Port or Starboard.... "
while I agree with Iranon on his last comment, I would say that all large WWII battleships had a response time to the rudder of about 20 to 30 secs + a turning time of 60 to 90 seconds for each 90° turn, when under "hard" rudder and at high speeds. I remember Herr Nilsson data for Bismarck (Bismarck couldn't turn at full speed with hard rudder anyway) confirming the above and Littorio class data that were almost the same. In emergency, PoW turned 150°- 160° in 90 seconds at Denmark Strait (see her own maps). Whether it was a good idea to turn so sharply, just in order to gain few seconds and open arcs, it's another question, of course, because you loose much speed in doing so and you mess up your own gunnery. @ 20 knots and full main rudder (35°) the 360° turn was completed in 6'35"
The two auxiliary rudders could be used only at low speed, when maneuvering in narrow waters and not at full speed. While "Crossing the T" could confer a technical advantage in the course of a one on one engagement , any such benefit would be very transitory in nature ... perhaps a minute or so before the "victim" would turn sufficiently to open her own A Arcs. "Crossing the T" was a much more advantageous tactical position in the case of a battle-line versus battle-line engagement. Not only would the head of the victimized force be subjected to the concentrated fire of (potentially) the entire opposing force, but this disadvantage would persist (in a slowly diminishing degree) for however long a period was required for the victim battle-line to turn in succession onto a parallel course. Hence Scheer's order for his battle-line to immediately execute a simultaneous turn away and disengage under cover of smoke and a torpedo attack by TB flotillas; even under the short time the HSF was under the fire of the GF line, it suffered material damage. The Battle of Surigao Strait was the last time battle lines met in this maneuver. I'm not sure how many salvos the OBBs got off. I find the concept of ''crossing the T'' difficult to understand. The ships being engaged from directly ahead by open broadsides are presenting the smallest target profile to the gunnery officers crossing the T. Unless the guns are exactly in line the target is going to be far more difficult to hit while they are presenting full broadside target to the forward guns of these targets. Surely the ships crossing the T are more likely to be hit simply by presenting the bigger target profile, particulary in instances where the target ship has triple or quad turrets carrying > 50% of their total number of guns. RF wrote: I find the concept of ''crossing the T'' difficult to understand. Twelve main guns on each ship in the horizontal, versus the six forward guns on the vertical plus whatever forward guns in the other ships in the vertical, some shooting long shots at the ends of the horizontal column. Say ten ships in the horizontal, 120 main guns. Vertical might muster up 24 guns that can actually fire for effect. Last edited by OpanaPointer on Wed May 02, 2018 7:57 pm, edited 1 time in total. Assuming that the Jutland diagram is approximately correct in terms of distances. note that most of the GF is engaging the head of Scheer's line at a range of about 10,000 yards; meanwhile two-thirds of the German line is altogether out of range of the British battle-line. No sort of organized fire distribution will be possible for those Germans within range of the British. Any German ship firing within +/- 30deg of dead ahead will be restricted to use of only half its main battery at best, which means problems with spotting due to under-salvoing. Funnel and gun discharge smoke from the leading German ships will obstruct vision both ahead and on the downwind side of the line. It is true that a head-on target aspect can magnify the consequences of deflection errors, although this principally manifests at long ranges when a lengthy time of flight will accommodate evasive maneuvers. The other side of that coin is that a straddle made upon an end-on target has a rather better chance of making multiple hits. A good example of short range fire upon a (more or less) end-on target is the practice made by 3BCS upon Lutzow as the leading ship of 1SG around 1830 hours..
No maneuver is perfect, agreed. The effect of crossing the T is to take out the lead ships, the ones with the senior admirals and the ones who had pride of place at the head of the line because of size, power, etc. Also remember that the standard reply was to have the fleet turn one after the other on the same spot, exposing the rear ships to the same treatment the van got at first. The "battle turn-away" avoided that. As late as 1938 the USN included plans to have the whole battleline do a "180" to continue holding the T and pounding the enemy if they didn't do the battle turn-away.